At first glance, it may seem Lawrence Township schools aren’t excelling when one looks at the Indiana Dept. of Education’s recent accountability grades for the 2017-18 school year. But Chief Academic Officer Troy Knoderer ensures students and parents that a poor accountability grade doesn’t necessarily mean poor schools. Twelve of Lawrence’s 17 schools increased their performance rates, and four rose a letter grade. Two decreased a letter grade. Five schools received a D. Brook Park Elementary received an F. Only two, Amy Beverland and Forest Glen elementary schools, received an A.
Knoderer noted that the state’s accountability grade is forged by proficiency scores and growth rates. 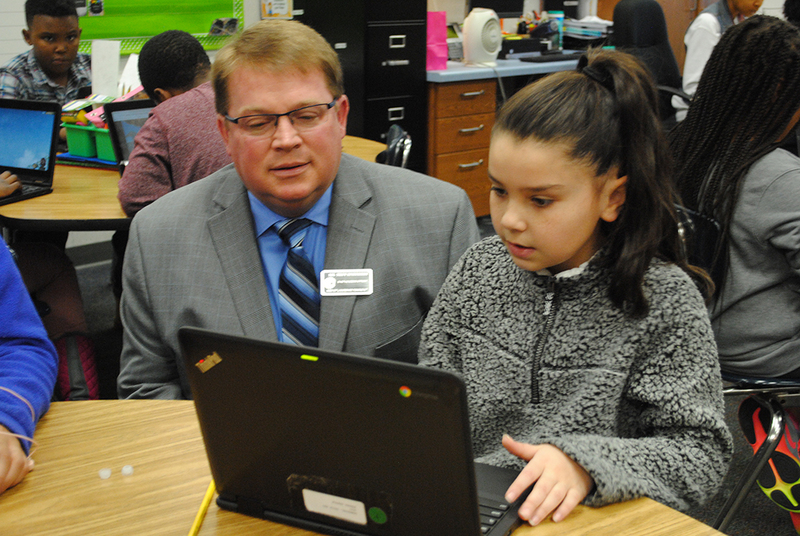 Although Lawrence Township may not excel in proficiency scores when students first take the ISTEP test in third grade, the growth rates, Knoderer said, are phenomenal. That’s because, due being in a lower socio-economic area, Lawrence Township schools sometimes have to meet students where they are when they first take the ISTEP test in third grade, Knoderer said. 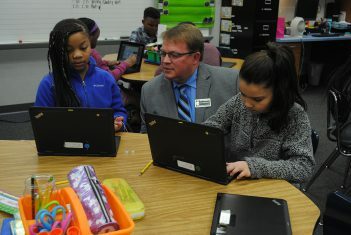 Kailyn Miliken, left, and Jayla Downhour, right, listen as Chief Academic Officer Troy Knoderer assists them with classwork. “You have to understand the formula of school grades,” Knoderer said. “Half of the formula is about student proficiency and students passing test, and the other half is about student growth. Forest Glen and Amy Beverland’s proficiency rate is higher, but in terms of student growth, every school in Lawrence Township is an A or a B. That growth is in how (students) scored as a third-grader and how they grew as a fourth-grader. Another reason Lawrence Township schools are highly regarded but have lower accountability grades is ISTEP only tests on English and math standards. Knoderer said science, technology, engineering and mathematics standards are taught frequently at the schools, but students aren’t tested on those skills on state tests. Compared to other state ratings, such as graduation rates, Lawrence Township well exceeds a 90 percent graduation rate. Knoderer said one method of improvement Lawrence Township schools are focusing on with the integration of the ILEARN test this year is increasing the instructional rigor in the classroom by creating a unique leadership model involving teachers. 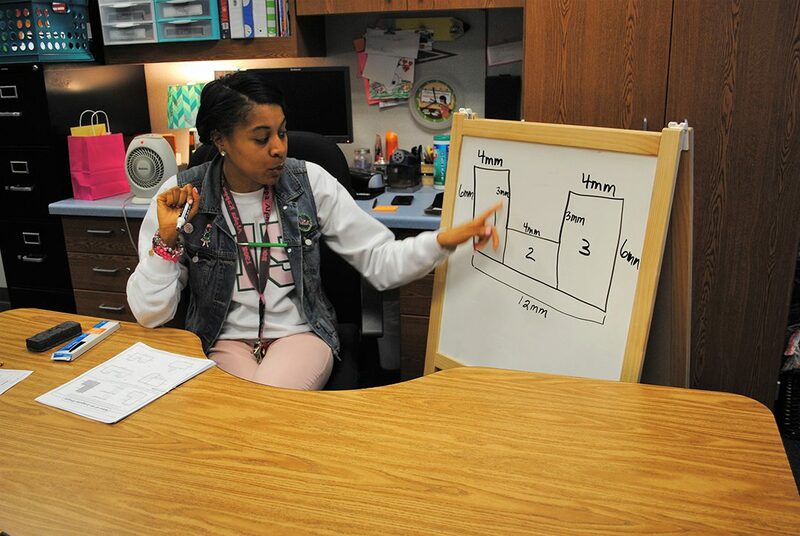 Kendra Randle teaches fourth grade at Winding Ridge Elementary in Lawrence. Although students have improved growth rates in their ISTEP scores, test anxiety can weigh a student down when taking the test. Winding Ridge Elementary teacher Kendra Randle struggled with test anxiety herself as a student, and she said an important factor in helping her students succeed is sharing her own experience with them so they know they are not alone in their anxiety. She also takes instructs them how to cope with the anxiety.